Extren® is a proprietary combination of fiberglass reinforcements and thermosetting polyester or vinyl ester resin systems. EXTREN® is produced in more than 100 standard shapes and all shapes have a surface veil to protect against glass fibers penetrating the resin surface in service and to increase corrosion and UV resistance. 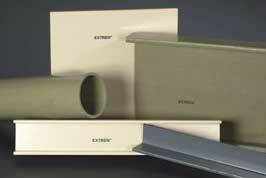 EXTREN® is offered in three series designed for different environments and applications.